Jussi Nevanlinna Wins 2015 Master Classics of Poker Main Event for €300,000! 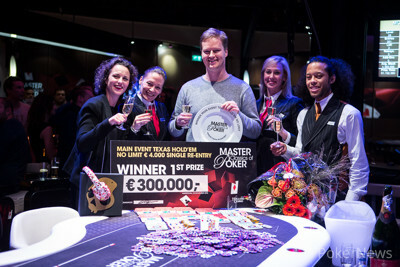 The fourth and final day of the €4,250 Main Event of the Master Classics of Poker saw nine hopefuls out of a 291-entry field return to action at Holland Casino in Amsterdam, chasing the exclusive winner's plate, Skullcandy headphones, and a first-place payout of €300,000. Ultimately, it was Finland's Jussi Nevanlinna who emerged victorious after defeating Georgios Zisimopoulos in heads-up play. Nevanlinna had already reached the final table of this event in 2011, where he finished runner-up to winner David Boyaciyan. Additionally, last year Nevanlinna finished in fifth place in this event. 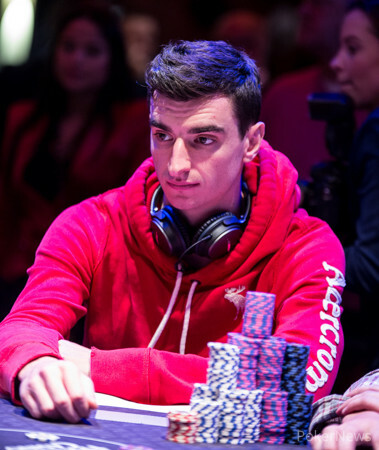 The final table started with a bang when Kilian Kramer exited in ninth place. The German, who had deep runs in both the World Series of Poker Main Event in Las Vegas and the WSOP Europe Main Event in Berlin this year, three-bet shoved out of the big blind with ace-queen suited and ran straight into the pocket kings of Nevanlinna, the initial raiser. 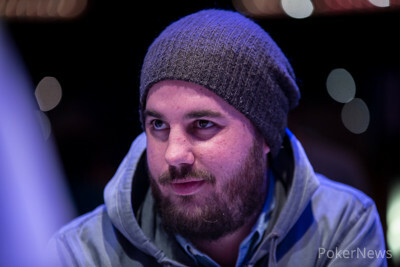 Johnny Hansen, recent third-place finisher in the WSOP Circuit Rozvadov Main Event, experienced the same fate after three-bet shoving ace-eight and getting called by Nevanlinna with ace-jack. Joep van den Bijgaart's elimination in the second level of the day came in a massive three-way all-in clash, and once again it was Nevanlinna who had the best of it. The Dutchman three-bet shoved with pocket sixes and Nevanlinna just flat-called with pocket aces before start-of-the-day chip leader Donald Rae reshoved with pocket kings. The aces held, Rae was left very short, and van den Bijgaart was eliminated. Clyde Tjauw Foe, who also made back-to-back final tables in this event the same as Nevanlinna, then won a big pot with bottom set against the two pair of the Finn before it was 2015 WSOP Europe gold bracelet winner Makarios Avramidis hitting the rail in sixth place. Down to only three big blinds, he shoved with ace-deuce and Nevanlinna called out of the big blind with ace-six before he found a six on the flop. Tjauw Foe then fell after a four-bet pot on a king-high flop resulted in his demise. He called the shove of Nevanlinna with king-jack for top pair when Nevanlinna had made a move with the for a flush draw. Another diamond immediately appeared on the turn to hand over the chips to Nevanlinna. Kees van Brugge had been down to four big blinds at one point, but he made the pay jump before shoving with jack-seven in a battle of the blinds. Zisimopoulos called with ace-four and an ace on the turn all but locked up the hand. It was the only elimination of the final table that didn't see Nevanlinna raking in the chips after. Rae made it all the way to third place after a massive pot early on against Nevanlinna. Nevanlinna four-bet shoved with ace-six, and the Brit called with kings only to see an ace appear right in the window. The heads-up duel was brief, with half a dozen hands being played. In the end, it was the of Zisimopoulos and the of Nevanlinna that decided the outcome of the Main Event. The flop was quite decisive, and it was all over after the hit the turn, making the river nothing more than a formality. With that, PokerNews' live reporting from the 2015 Master Classics of Poker has come to an end. Next up for our team on the circuit will be Unibet Open Antwerp from Nov. 26-29 in Belgium. In a raising war, Georgios Zisimopoulos got his remaining 18 big blinds in before the flop and Jussi Nevanlinna quickly looked him up to reveal the better kicker in showdown. The flop all but locked up victory for Nevanlinna and it was officially confirmed as soon as the fell on the turn, making the river a formality. Zisimopoulos had to settle for second place and a payday of €178,616 while the third final table appearance for Nevanlinna was the charm. Jussi Nevanlinna opened to 130,000 and Georgios Zisimopoulos defended with the to see the flop . Both players checked and Zisimopoulos check-called a bet of 120,000 on the turn with his bottom straight. Zisimopoulos also checked the river and snap-called a bet of 350,000 by Nevanlinna to see the bad news. The Finn had turned a higher straight with . The first hand of the heads-up duel saw Jussi Nevanlinna take down the pot on the turn of a turn with a bet, holding for the open-ended straight draw. Georgios Zisimopoulos had not connected with his and gave up the hand. The flop came and Nevanlinna had immediately improved. Both the turn and the river blanked and that sent Rae to the rail in 3rd place after pocket kings became his nemesis for the second time today. There is now a short break to set up the heads-up duel for the title and payday of €300,000. In a limped pot, Jussi Nevanlinna checked the turn and Georgios Zisimopoulos bet 75,000 into a pot of 370,000. Nevanlinna called and they saw the on the river. 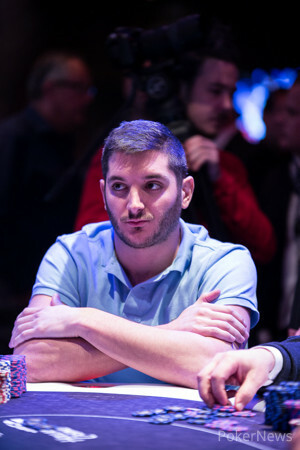 Zisimopoulos bet 200,000 with the and Nevanlinna called with the inferior to drop some chips. Georgios Zisimopoulos limped the button for 60,000 with the and Donald Rae called in the small blind. Jussi Nevanlinna raised to 160,000 out of the big blind with and then folded to the shove of Zisimopoulos for 1.1 million. Donald Rae opened to 130,000 from the button with and Georgios Zisimopoulos defended his big blind with the . Both players hit the flop but checked. On the turn, Zisimopoulos check-called a bet of 140,000 and then bet the river for 60,000. Rae called and won the pot with a pair of aces. In a battle of the blinds, Kees van Brugge open-shoved for 535,000 chips and Georgios Zisimopoulos called in the big blind. The flop saw neither player hit anything while the Greek spiked a pair of aces on the turn. Only a queen could save van Brugge, but the local player headed to the rail in 4th place after the fell on the river.